Apricot poodles are among the most beautiful of the breed. Their coats are a sunny, gleaming color, as implied by the name. Apricot poodles may have some variation in their color, such as a slightly darker feathering on their ears and/or tipping on their ruff. This variation is not considered a fault under the breed standards. 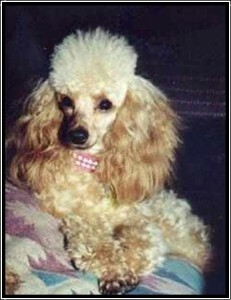 No matter what the color, your poodle will have a beautiful, curly coat. Poodles do not shed, which makes them perfect for people with allergies. However, they do need regular grooming to keep them looking their best. You should brush your puppy at least every other day to keep the coat from becoming tangled and matted. Here at Homestead Poodles, we raise our puppies in our home. They are handled, groomed and lavished with affection, so when they come to you they are well-groomed and completely socialized. Because of their initial upbringing, grooming them will be a much easier process for you. It is important to note that your puppy should be bathed regularly, ideally twice a month. The toenails must be clipped, ears cleaned, and coat clipped in one of several different patterns. It’s generally best to let a groomer take care of the clipping at first, though many owners enjoy learning to do it themselves. Don’t expose your puppy to the grooming shop until after 16 weeks, when he/she will have had his/her shots for distemper and parvo.